Don’t wait until your child begins to suffer from back pain or neck pain. Come by our office and have one of our experienced health professionals check their backpack today! Watch this message from the National Safety Council. Back pain and neck pain in children, teens and young adults is often associated with carrying heavy backpacks. Lowcountry kids are back in school after summer break and most have already been assigned their textbooks, which means your child could already be at risk for backpack related neck pain and back pain. 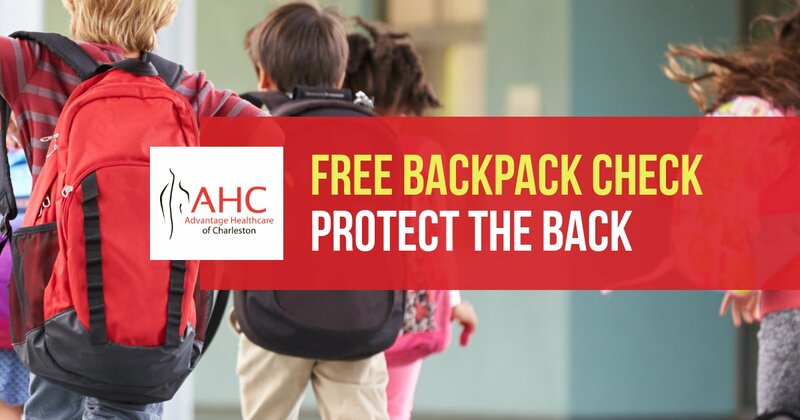 Advantage Healthcare of Charleston is conducting free backpack checks to help your child start the school year off right. The American Chiropractic Association recommends that your child’s backpack be no more than 5% – 10% of their total body weight. And, even a backpack of appropriate weight can cause back pain and neck pain if not carried correctly. We will be checking both the weight of the backpack and whether or not your child is carrying it properly. We will weigh your child and their backpack to determine if the backpack is too heavy for their body weight. A heavy backpack results in the need to bend forward, causing significant strain on the back. We will assess how your child is carrying his or her backpack. A backpack hanging too low can also result in the need to lean more forward, especially when walking. We will adjust the shoulder straps so the backpack is properly aligned with your child’s body and positioned to reduce the chances of spinal misalignment, a major cause of back pain and neck pain. We will evaluate how your child’s backpack is packed to make sure the weight is distributed in a manner that reduces the risk of back pain and neck pain. We will offer additional recommendations as needed. Why Do I Keep Gaining Weight? What Makes AHC Different from Pain Management Doctors?